Kids and music – put them together and there’s always a party! 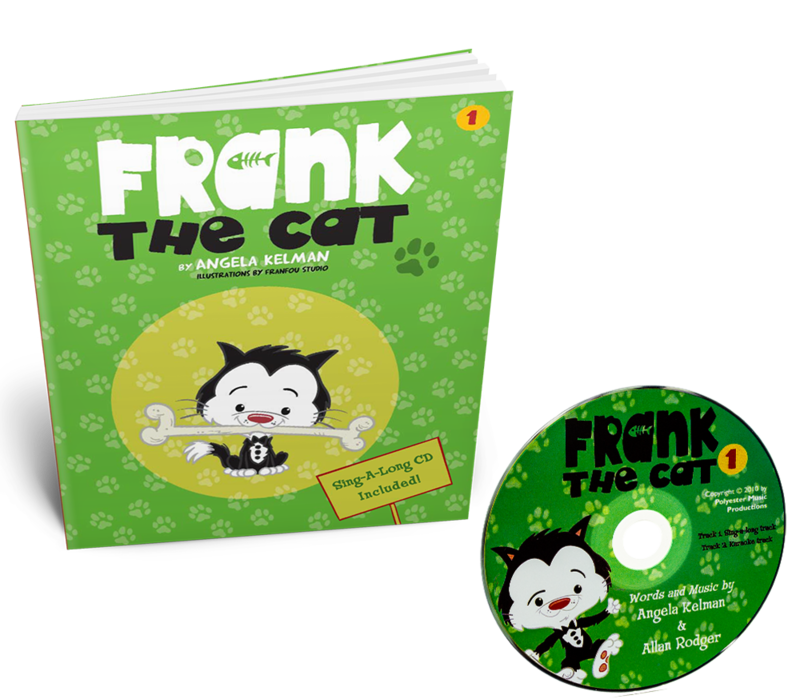 Frank is an adorable little cat who likes to behave like a dog. The other cats don’t quite know what to think of that, but Frank goes on his merry way just being who he is. 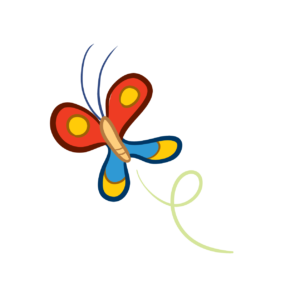 This is a delightful story/song about recognizing differences, tolerance and acceptance. But finding creative new music for children isn’t always an easy task. Unless, of course, you’re Angela Kelman. This Manitoba-born singer/songwriter of the award-winning group Farmer’s Daughter knew when she became pregnant that she wanted to pass her love of music on to her son. But instead of merely sticking with the standards, she put her musical experience to work and created an original CD of children’s music guaranteed to get kids moving and grooving. Angela May’s Magnificent Musical Menagerie was incredibly popular among children and adults alike and was even nominated for a Juno award. With the wonderful response the fun and narrative songs had received, creating a line of children’s books from the lyrics was the next project, and each book includes a CD of the song so that children can read along and sing along! There are currently two books available with a third coming out in the near future, and I was lucky enough to be given the chance to review these wonderful sing-along books for myself. I received the first two books in the collection, Frank the Cat and Disco Dinosaurs, to review. I opened up Frank the Cat first, and the first thing I noticed about the book was the bright and busy illustrations. With fun cartoon characters and plenty of detail, the pages were a feast for the eyes and Zackary eagerly insisted I put on the CD right away so that he could listen to the song and follow along with the book. I put on the CD and sat with Zackary as we flipped through the pages. The story is about a cat that thought he was a dog and his various antics as he imitated a typical dog’s behaviour. The melody is incredibly catchy and the chorus was easy enough to remember that by the end of the song Zackary and I were both singing along! The CD contains a second track without words so that children can sing along on their own, karaoke-style. Zackary’s a little bit young for that concept yet, but in a year or two when he starts really learning to read, I’m sure the sing-along books will be an incredible teaching tool since by using the second track he will have to read along as he sings. The book also includes the sheet music for the song so that young musicians can play the tune for themselves. I couldn’t resist sitting down and playing Frank the Cat for my sons, and both of the boys were so impressed by the fact that I could play the same song that was on the CD! The second book featured the same colourful and child-friendly style of illustrating as the first book had, and after seeing how much Zackary had enjoyed Frank the Cat I couldn’t wait to see what he thought of Disco Dinosaurs. 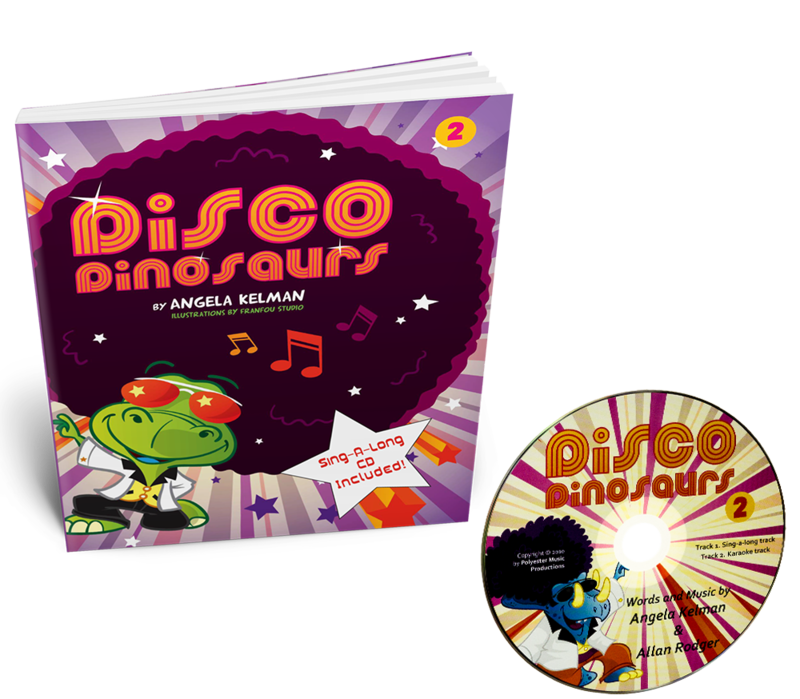 The melody is very much a disco-style tune, and picking it up to the point where we could sing along took a little longer than it had with the first sing-along book. But there was some repetitive Doo-doo-doo sections that we joined in with as soon as they began, and Zackary loved the way that those portions ended with an energetic “Wooooo!” Both Zackary and Benjamin couldn’t help but get up and dance when we were listening to this song, so I played it a few times until they had danced themselves out and then we sat down again to listen to the song one final time as we followed along in the book. We have had these books for almost a month now, and Zackary still requests them regularly. 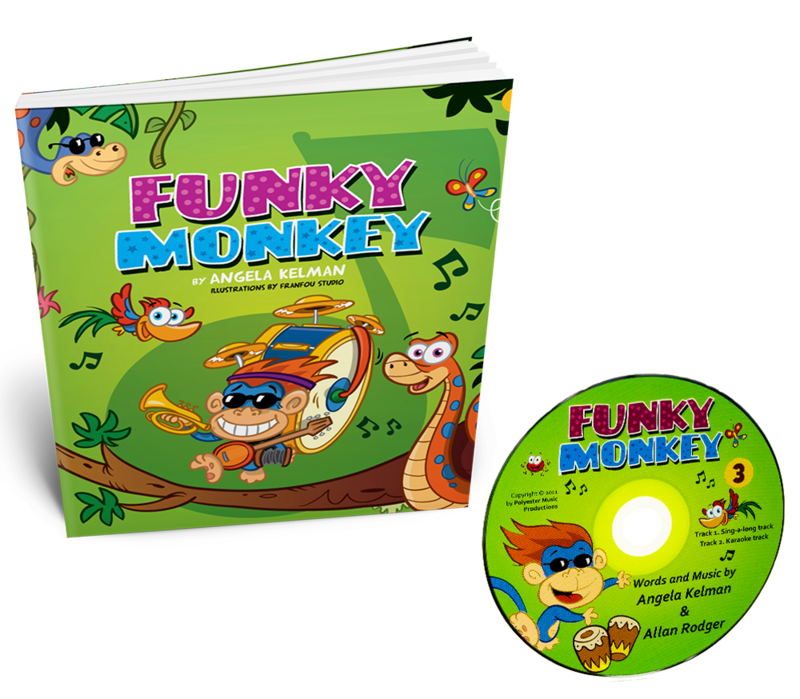 Sometimes he sits down and flips the pages of the book as he listens, and other times he simply jumps around to the song, but there is no question that he loves the Angela Kelman sing-along books and music. He periodically asks questions about certain lines in the songs (“What does ‘Do the Hustle’ mean?” he asked me recently after listening to Disco Dinosaurs for the tenth time.) and often sings the lyrics at random times as he is playing on the floor or when we are out walking. In fact, I often do the same thing, which means that no matter which one of us starts singing, Zackary and I will often break out into impromptu performances during the day. Yes, the songs are just that catchy! I was very impressed with these fun and fresh sing-along books and I know we will enjoy them for many years to come. 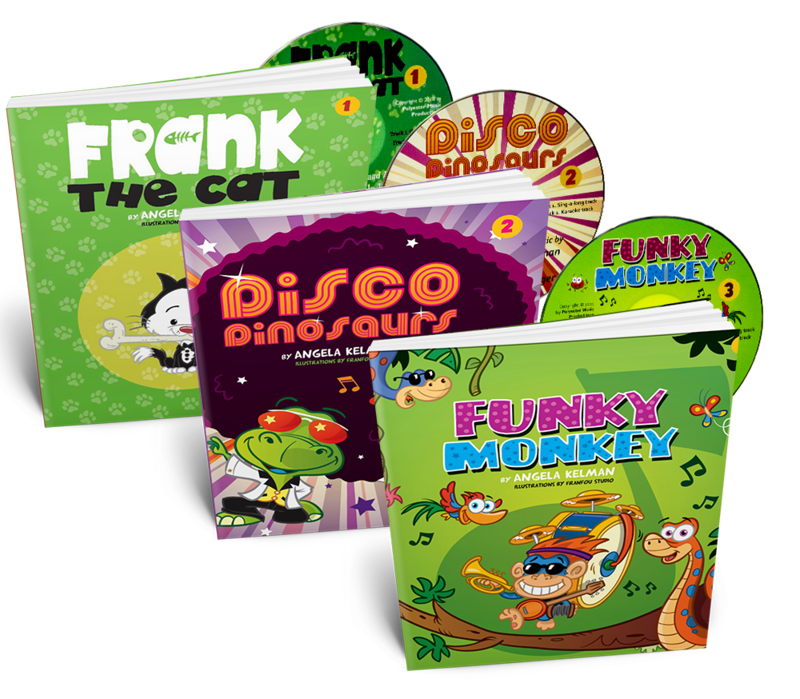 The combination of the book and CD means that both preschoolers and older children can enjoy these books, and the rhyme, rhythm and repetition in the music are all proven to be incredibly effective learning tools. But as beneficial as these books are for building literary strength and musical appreciation, the best thing about them is how much fun they are. Children are sure to enjoy both the stories and the songs, and best of all, parents will too! Why not check out these great books and see for yourself how much fun children’s music can be?